Affectionately nicknamed “The Gherkin” for its unusual shape, the dazzling glass-fronted skyscraper at 30 St. Mary Axe is among London's most distinctive landmarks, looming 590 feet (180 meters) over the City of London financial district. The Gherkin is not typically open to the public, although the top floor hosts a private member’s club and there are a number of bars and restaurants in the piazza at the base of the building. Enjoy impressive views of The Gherkin during a London Thames River evening cruise or a ride on the London Eye; see the landmark up close on a walking tour of historic London; or combine a visit with nearby London attractions like London Bridge, The Monument, the Tower of London, or St. Paul’s Cathedral. There’s no regular public access to the inside of The Gherkin. Most of the bars and restaurants in the building are wheelchair-accessible. 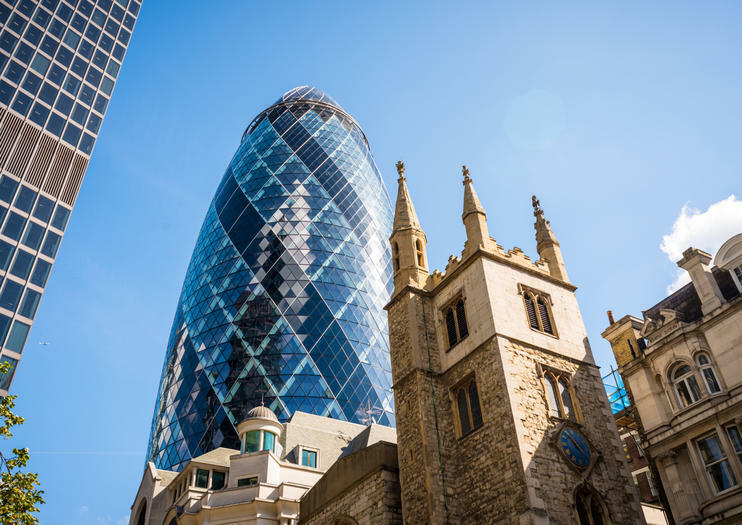 Located in the City of London financial district, The Gherkin is within walking distance of the Tower of London, the Monument, and Old Spitalfields Market. The closest tube stations are Aldgate on the Circle and Metropolitan lines, and Liverpool Street Station on the Central, Hammersmith & City, Circle, and Metropolitan lines. The striking landmark looks even more dramatic at night, when its shimmering facade is illuminated. Largely regarded as a masterpiece of contemporary architecture, The Gherkin’s award-winning design was the work of Norman Foster, whose company also renovated buildings such as the Reichstag in Berlin, London City Hall, and Wembley Stadium. While best known for its resemblance to—you guessed it—a gigantic gherkin, the eye-catching design also includes energy-conserving features such as spiraling light wells and ventilation shafts. Today, the famous office building houses companies such as Swiss Re and Sky News.